Odoo is a complete management solution that provides all the applications needed to run your business. In the modern world, all companies must have a website. You could of course pay a developer to create a website for your business and host it on a shared or dedicated server. However, Odoo makes your life easy by including a free website builder that allows you to build an enterprise website. In addition, you can host it on your server with no additional costs. In this article, we will teach you how to design a simple website and make it available on the Web. The website builder is one of the optional Odoo modules. It might be already active on your server, otherwise you can easily install it. If you don’t have a self-hosted Odoo instance running already, make sure to check out our Odoo hosting packages. Click on Apps in the top bar, locate the Website Builder module and click on the Install button. The program will do some work in the background and then prompt you to choose a theme, the default one and bootstrap are available in this example. The next screen will already display a basic homepage, it’s time to edit it in order to build an online image for your company. Customizing your site is easy even for people with no technical skills, you just have to follow the instructions on the screen. The Odoo website builder provides an interactive procedure, continue as advised and follow the tear signs. The first step is to click on the Edit button in the top left corner of the screen. The builder is structured as a series of modular blocks that can be dragged and dropped on the page. They are grouped in a sidebar on the left side of the screen. As suggested, start by dropping a cover block on the screen. The result is a container that can be customized, relocated, deleted or even cloned. Click on the Customize drop-down menu for even more options, there are several images provided but you can also use a custom one. Every element of the block can be modified. Experiment with more blocks by placing for example an image-text one under the cover. Remember to save your work from time to time, or discard any unwanted changes. You can return to the Edit mode at any time afterwards. It is important to personalize all of the generic texts and links on the default page, otherwise your website will look unprofessional. Texts can be changed using the commands on the top bar. 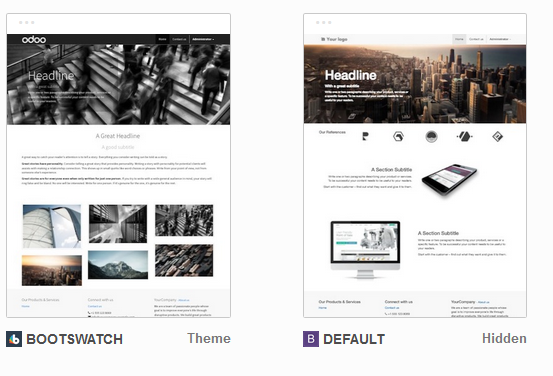 The structure blocks on the left sidebar allow you to build a pretty rich site, so try them out. They are grouped in several sections: Structure, Feature, Effect and Inner Content. Some blocks are not available by default and will appear greyed out. Place your mouse over a block in order to reveal an Install button that will lead you to the Apps section in a separate window, from where you can activate it. Once the first page is ready, you can click on the small mobile phone icon in the top right corner to inspect a mobile preview. Continue by creating additional pages from the + New button but an even better idea is to click on the small progress bar icon. The pop-up window that opens is a planner-type application that provides useful advice and general site-building strategies. The last section introduces some advanced concepts such as SEO (Search Engine Optimization) rules, website translation options or how to configure other online services, such as forums or newsletters. 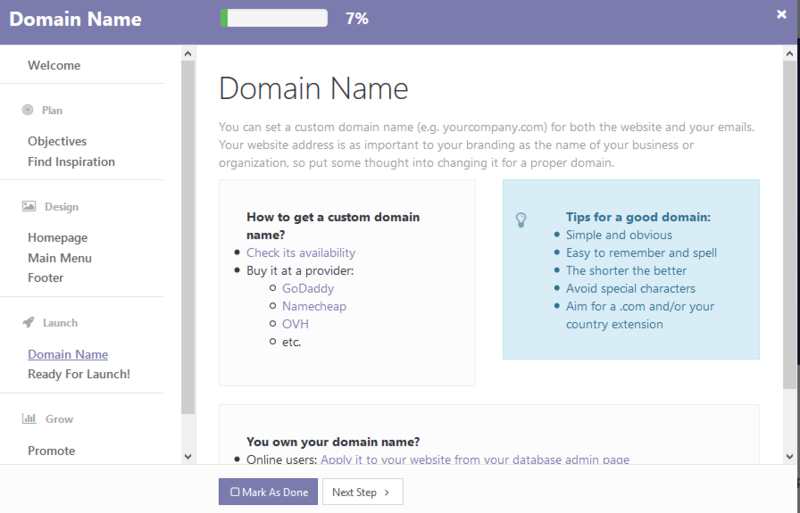 It also offers tips on how to buy and use a custom domain name for your website. More tools are available in the top left corner on the screen, in the Content, Customize and Promote sections. One of them is an editor of HTML and CSS that can be used to change any aspect of a page, if you have coding skills. That was it, your website is now live and can be accessed directly from your Odoo server. You can hide it at any time by adjusting the Publish/Unpublish button. 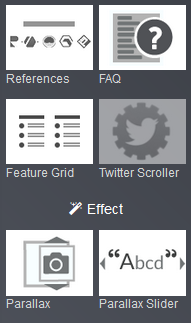 You will also notice that a Website entry is now present in the main menu of Odoo. Clicking on it opens a special dashboard that allows you to access the page, as well as other options. Use the dashboard to add extra features such as contact forms; linking a Google Analytics account will display statistics such as the number of visits and the identity of the visitors. 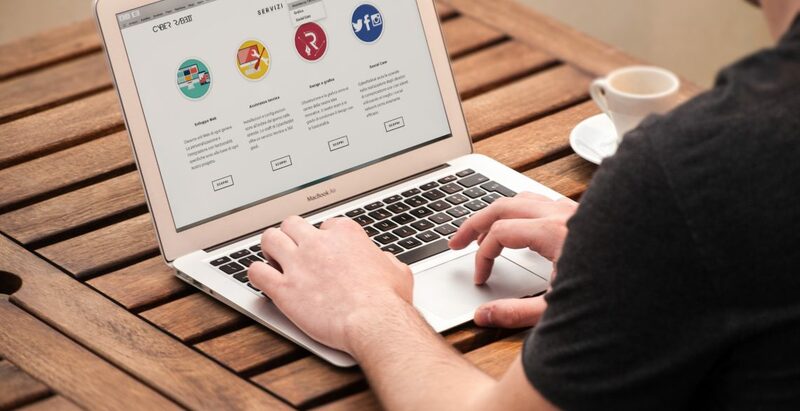 While the Odoo Site Builder is not as powerful as a commercial website design solution, you can use it to quickly create a professional-looking site. Site building is no longer a complicated task, not even for people without technical skills, and even advanced features can be deployed quickly with just a few clicks. Looking to get your Odoo instance deployed? Check out our packages and contact us if you have any questions!